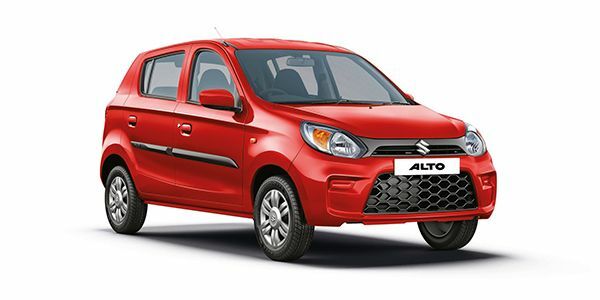 Maruti Suzuki has launched the updated version of the Alto in India. The hatchback now packs some essential safety kit along with a BSVI-complaint engine. The hatchback also receives some styling revisions, especially at the front which now features an all-new grille and a redesigned bumper. Powering the Alto is the same 796cc, 3-cylinder engine which makes 47PS/69Nm of torque. Safety features include a reverse parking sensors, a driver airbag, a speed alert system and seatbelt reminder for both front occupants along with ABS and EBD. The tops-spec VXi variant even gets a front co-passenger airbag as standard while it is optional on other variants. The updated Alto is available in three variants with prices starting from Rs 2.93 lakh (ex-showroom Delhi). Maruti Alto prices start at Rs. 2.94 lakh for petrol and goes upto Rs. 3.72 lakh. Maruti Alto is available in 5 variants . Share your experiences with Alto 800? The claimed ARAI mileage for the Maruti Alto petrol is 24 kmpl. Q. For city running about 5 km a day, which car to buy from Maruti Alto 800 or K 10? Q. Can new alto 800 will be suitable for 6 feet tall driver with enough legroom for passengers at back seat? Q. I want to purchase a new automatic transmission car with an EMI below 10000. My need is 30 to 40 km per day. Please advise. Q. I need car with low budget with daily 100 km driving? Q. Please suggest cars with minimum width and company fitted CNG. Is automatic variant is available in company fitted CNG cars. Q. This car have how many variants? There is no update from the brand's side regarding the variants as the car has not been launched yet. Stay tuned to ZigWheels for more updates on it. Confused about Maruti Suzuki Alto?